A couple months ago I noticed that a favorite pot of mine, a 3-qt, chef’s pan, was not looking very good. It was an in expensive pot that I’d picked up on a whim one day. The size was good and it was red. I’m a sucker for red kitchenware. Over the years it’s been used a lot and has been one of my favorite pans but, as less expensive pans tend to do, it was now showing it’s wear. I made a mental note that I’d need to replace it soon. And then about a week ago I noticed that Calphalon was having one of its sales where they substantially mark down some of their pots and pans. Fair warning: this is sometimes as they are getting ready to discontinue a line. I don’t know for certain this is the case but something you might want to keep in mind. I have a lot of Calphalon and I love it. Most of my pieces are from another line that is now discontinued, the professional hard anodized line. So when I noticed the specials I decided to check them out. This time the discounted pieces are from the Tri-ply copper line. These pieces have copper on the outside, an aluminum core for even heat distribution and a stainless interior for easy clean-up. Crate and Barrel is carrying a couple of the pieces, so I was able to physically check them out. But the biggest selection of pieces is online at Amazon. I liked the feel and the look of them – although I do wonder how much work the copper will take – so I picked up a couple pieces. 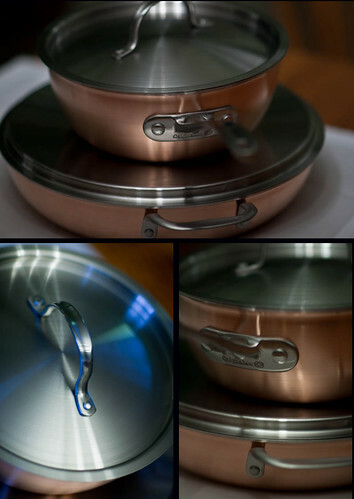 The first, the Calphalon Tri-Ply Copper 3-Quart Chef’s Pan , is the replacement for my little red pan. I also picked up the Tri-Ply Copper 12-Inch Everyday Pan just because I liked the look of it. The 5-Quart Saucier and the 2-1/2-Quart Shallow Saucepan are also marked down and I have these pans in the professional hard anodized versions. I love them both and use the 2 1/2 quart saucepan so much that I bought two of them. If you are in the market for new cookware or a fill-in piece or two, you may want to check this sale out. Good deal. I just started collecting Calphalon tri-ply pots and omlette pans. There\’s one more saucepan I still need to get to complete my set. I decided to get them separately instead of in a set, it seemed cheaper that way. I got most of them for good prices at TJ-Maxx and Marshalls. I noticed Amazon was having some good prices and will probably buy a saucepan from there. @ Paula: Yeah, sets can work either way. If they really are the pieces you want they can be a deal but I generally lookf for specials and buy open stock. @ Stephanie: Clean up so far is easy but I\’m waiting to see what happens with the copper over time. As for knives, as long as you are buying good quality (and there are lots of good lines outs there) you just want to make sure the knive fits you. That it\’s balanced in your hand. When you go to buy one, hold it, pretend to use it so you can see how it feels.